Collaboration between Cornerstone OnDemand and researchers at Harvard Business School uncovers how the distance between two employees’ desks affects various performance measures. According to the findings, placing the right type of workers in close proximity to each other has been shown to generate up to a 15% increase in organizational performance. 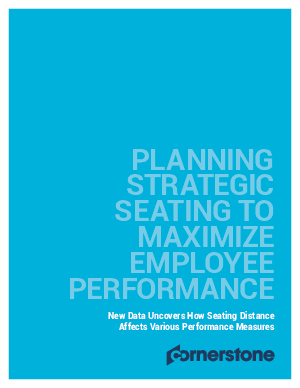 For an organization of 2,000 workers, strategic seating planning could add an estimated $1 million per annum to profit.